If you’ve ever had the situation where you are, locked out of your Android Tablet or phone, then you already know that it can be a frustrating experience. If your Android phone or tablet isn’t acting right, or may have a virus, you. You can boot directly into recovery mode and use it to factory reset. Sometimes we forget our passwords. Sometimes the Android phone or Android tablet got hanged. We feel so irritated that we keep going to press the power button. Definitely if your device is not going to work quickly you feel bad. You have option of factory reset. Another main problem is that when we use a device and we want to sell it out further to someone. Then the first thing come in our mind is that, what about the applications and data stored in your device. Obviously you don’t have time to go to uninstall option and uninstall each and every app one by one. 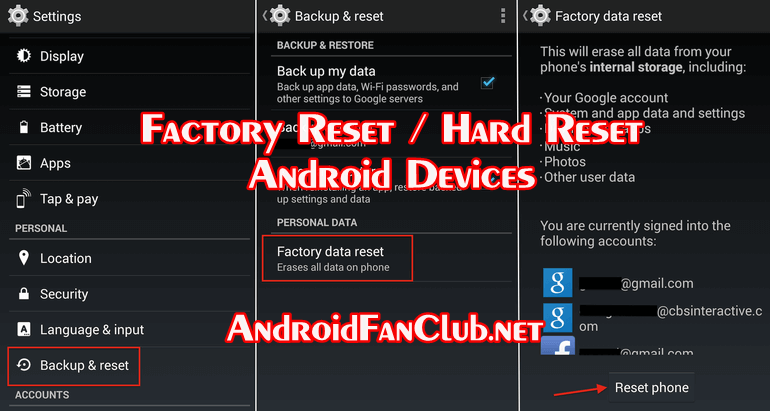 Here comes the option of factory reset of your Android phone and Tablet. The main problem of factory reset is the viruses. When a virus comes with our device, it affects our data as well as our device. And if accidently you attach your phone or tablet with your PC or laptop, the virus directly goes into your PC and laptop. Here we are discussing about that how we can do a factory reset of any android tablet or phone. This is the normal method means your handset/tablet is working properly and you have access to your Smartphone. Please backup your downloaded apps and other data to SD card. So let’s begin. 1. First, go to settings on your tablet or phone which you want to factory reset. 2. Scroll down and press privacy and in tablets backup and reset. 3. Press factory data reset click on it. 4. Accept the warning which is given by the pop up. 6. You just need to wait for a few minutes. 7. Do not do anything while handset is resetting, because it is erasing your all data and restoring your Android phone or tablet..
8. Congratulations. Your android device has been factory reset done completely. 9. Now the Android operating system on your phone is as new as when you purchased the handset. 10. You can now use it like the way you want to. If you need to erase / wipe / factory reset / hard reset your android smart phone or tablet from the recovery of your device, probably there are three or two button combinations which let you explore the recovery menu of your android device. How To Boot Android into Recovery Mode? After booting into recovery mode you need to choose wipe data / factory reset option. You can navigate with volume keys and could select the option with power key or in some devices you need to touch options key for selection. Now your device will boot up as a brand new one, as it comes from the factory. Your device software is now refreshed and you will feel smooth user experience.